Sailors who sail are happy sailors. Tired and happy, the 4,000 crew members competing in Saint Tropez are this evening struggling to grasp the fact that they’ve already competed in the last race of this exceptional 20th edition of Les Voiles this afternoon. The adrenalin of the fiercely contested racing is now slowly subsiding, after the tension of the long close-contact coastal courses for the Classic and Modern yachts, and the excitement of the series of windward-leewards linked together off Pampelonne by the Wallys. For a long time to come, Saint Tropez will resonate to the sounds of the enthusiastic exchanges in multiple languages among sailors the world over, who are already keen to rediscover the next extraordinary cocktail of conviviality, spectacle, nautical history and sport that make Les Voiles so special. The prize-winners in this 20th edition are now known and tomorrow they’ll receive a just reward for their efforts during the traditional prize-giving ceremony organised in the Village for Les Voiles de Saint-Tropez. A full week of racing! The gale that swept across the bay and shook up Les Voiles at the start of the week finally ended up being snuffed out, leaving the way clear today for a very pleasant breeze from the south-east, the benefits of which were maximized by the various race committees, who launched two fine windward-leewards off Pampelonne for the Wallys, and a coastal course in the gulf for the classic yachts, whilst the Modern yachts sailed a big triangular course of nearly 20 miles offshore. It was enough to definitively mark out the hierarchies, which were hinted at early on in the week. Tomorrow, Saint Tropez will crown the top players, some of whom were widely expected and others who really took the field by surprise. 6 races validated for the Wallys Magic Carpet3 and Lyra continued their cordial yet aggressive clash right to the wire today. Two windward-leewards were on the programme in optimum wind and sea conditions. Despite going before the International Jury and being disqualified in the final race, the 80-footer Lyra has been declared the winner of the BMW Trophy. The Mini Maxis untouchable There was a surprising result among the big IRC As with the 72-foot Mini Maxis reigning supreme, the hunt for glory quickly coming down to a duel between Jethou and the new Botin-design Cannonball owned by the Italian Dario Ferrari. The latter, supported by the America’s Cup specialist Sébastien Col, won three of the four races validated and triumphed in the overall ranking after a series of tantalizingly close races, with mere seconds between the boats. It’s worth noting here the stellar handling of the newcomer to Les Voiles, the Italian Twin Soul B, a very high-performance Mylius 80. Taking the win yesterday, Wallino completes the podium. Gladiator excels in the Saint Tropez arena We were expecting great things from the cut-throat jousting promised by the IRC Cs, a group that gathers together yachts of around fifteen metres in length, designed for racing and performance, such as the TP 52s and the Swan 50s. The favourites were where they were supposed to be and topping the charts we celebrate the British TP 52 Gladiator (Tony Langley), which dominated play today, letting no one have the privilege of crossing the finish line before them. The A 40 RC Team Chalets owned by Philippe Saint André was forced to accept the runner’s up prize, the two boats only able to be separated by the number of victories. The winner of this very dense group in terms of quality and quantity (32 boats) will tomorrow be awarded the Edmond de Rothschild Trophy. 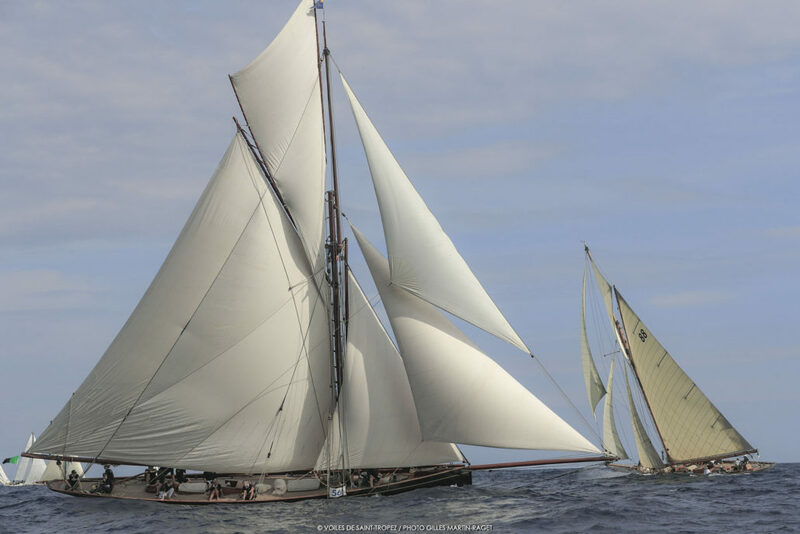 The Classic yachts put on a show in the gulf A limpid air, a quivering gulf and a fine, predominantly easterly wind created a wonderful display along the incredibly photogenic shores around Saint Tropez that provide the perfect backdrop for the majestic 120 Classic yachts. The enchanting spectacle of the gaff and Bermudan rigs making headway under sail has been captured by hundreds of international photographers. Stars among the stars were the 20 splendid craft penned by the master himself William Fife. Gathered together under the Fife Jubilee banner, all eyes were on this group throughout this fine week in Saint Tropez. The 1908 gaff cutter Viola, helmed by the French Mini sailor Fabien Desprée, ultimately triumphed to secure the highly coveted Rolex Trophy after a fantastic face-off against the speedy Swiss 8 m JI Carron II and the sublime 1898 cutter Kismet. Hispania bagged a creditworthy 6th place within this star group to finish ahead of the other three 15 m JIs. http://www.lesvoilesdesaint-tropez.fr/les_voiles_de_saint_tropez/wp-content/uploads/18VSTD7_2075.jpg 1417 2126 SNST99@beauVAR-83 http://www.lesvoilesdesaint-tropez.fr/les_voiles_de_saint_tropez/wp-content/uploads/vdst2017siteOK.png SNST99@beauVAR-832018-10-06 22:03:322018-10-06 22:25:22Les Voiles Sails On! Retenir les Voiles ! Tous prêts pour les 20 ans !